More and more people are developing an interest in water sports. Among the most popular water sports is jet skiing. Before my first visit to Myrtle Beach, I never thought I would get so hooked to jet skiing. Now my summer holidays cannot be complete before I hop on a jet ski and hit the water. You too can learn how to jet ski. Although learning to jet ski can be nerve-wracking for beginners. It is quite easy and fun once you learn to handle and maneuver the jet ski. My experience with the folks at Action Water Sportz was a wonderful one and I would definitely recommend them to anyone. Before you turn on the jet ski, make sure you are in proper jet skiing attire. A life jacket is particularly important. An accident can happen even when you ride with a lot of care. A life jacket will keep you safe during the ride. Another safety feature in jet skis is the engine shut-off clip. It’s supposed to be attached to your waist any time you are riding a jet ski. It turns off the engine in the event of you losing your balance and falling into the water. As you prepare to take off for the first time, make sure you are holding the handles of the jet ski firmly enough. Keep your speed low as you start engaging the throttle. A safe speed would be 10 mph or less. Avoid going too far away from the shore. Once you are fully familiar with the machine and can maneuver it comfortably, it is time to get further into the waters. Accelerate slowly as you move further out. 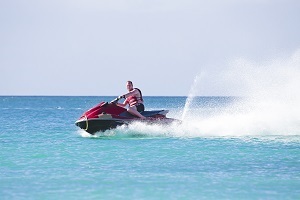 As the speed increases, the nose of the jet ski will lift slightly from the water. This is normal and should not make you panic. It is normal for beginners to have some difficulty turning at first. This should not discourage you at all. You will get comfortable as you continue learning and practicing at low speeds. Remember to practice your turns close to the shore to avoid potential mishaps with other boats. As I mentioned earlier, it is normal for the jet ski to lift off the water as you gain speed. When this happens, just lift your body a little bit above your seat to minimize the impact as the machine hits the water surface again. This is one of those things that you will enjoy once you fully learn how to jet ski. When overtaking, stay as far away as possible from the vessel you are trying to overtake. This helps keep the person controlling the other vessel aware of your presence. It also keeps the boat from blocking you or even veering off. Although there may be a temptation to veer too deep into the water, it is important for you, as a beginner, avoid straying into unchartered waters. This will keep you from colliding with other vessels as you continue to learn more about jet skis and jet skiing. At Action Water Sportz we always send an experienced guide out with every group. Be sure and let the guide know if this is your first time on a jet ski and they will be sure to show you the ropes.